We provide your child with a comprehensive, play-based approach to learning. At Apple a Day we believe in setting the stage for lifelong learning with healthy building blocks. From infancy to kindergarten, children progress through many developmental stages. As a busy parent, you understand the importance of finding safe, healthy child care that fits your schedule. You're looking for a place that will keep your child safe and happy while offering a kindergarten readiness program. A program that will nurture your child physically, emotionally and academically from infancy to the first day of kindergarten. Apple a Day Preschool and Infant Center understands your family's needs. 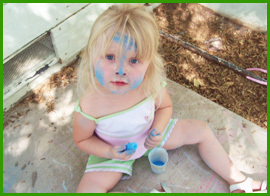 We think our center offers families the best child care option in town. Please visit us, we think you’ll agree! We believe a healthy child is a happy child. Nutrition, exercise and cleanliness are all essential elements of the Apple a Day program. Apple a Day kids explore, experiment and create in a safe and healthy environment. Healthy kids, healthy minds and healthy families -- that's what Apple a Day is all about. We believe children are happiest when they are physically comfortable and offered fun and educational activities. We believe parents are happiest when they trust their child is safe and well cared for each day. We strive to achieve both with our healthy program.